A (RARELY SEEN) FOX SQUIRREL IN GLOUCESTER MASSACHUSETTS?? Rare for Massachusetts that is. This afternoon a very unusual colored squirrel briefly stopped by our garden. He sat atop the fence post, had a quick snack from our neighbor’s black privet berries, then departed as quickly as he arrived. At first glance I thought he was a Red Squirrel, but he was much, much too big. Next thought, perhaps a melanistic Gray Squirrel. Or perhaps a Gray and an American Red (Tamiasciurus hudsonicus) had interbred, but that isn’t possible. However, I did learn a Gray Squirrel (Sciurus carolinensis) and a Fox Squirrel (Sciurus niger) can interbreed. But possibly what we have here is an actual Fox Squirrel, which would be quite uncommon for Massachusetts. I am still researching this. 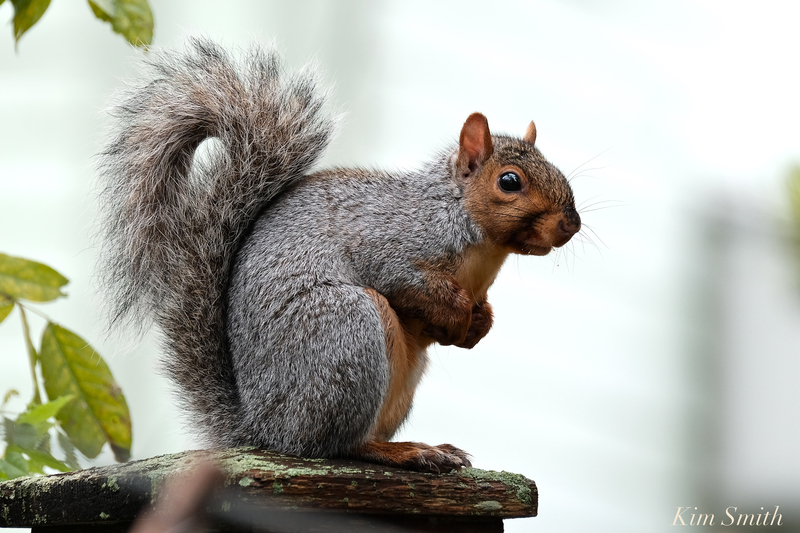 If any of our readers has seen a Fox Squirrel in Massachusetts, please write and let us know. Thank you in advance. Fox Squirrels are diurnal, which means they feed during the day. This little guy stopped by for a snack at about 1:30 in the afternoon. Conversely, Eastern Gray Squirrels are crepuscular, which means they are more active during the early and late hours of the day. In this year of tree squirrel super abundance, I wonder, too if that could possibly be an explanation for an appearance by a Fox Squirrel; perhaps expanding its territory in search of food. The coat of a Fox Squirrel comes in many colors, from nearly all black to rust, tawny gold, and gray combinations–like a fox. 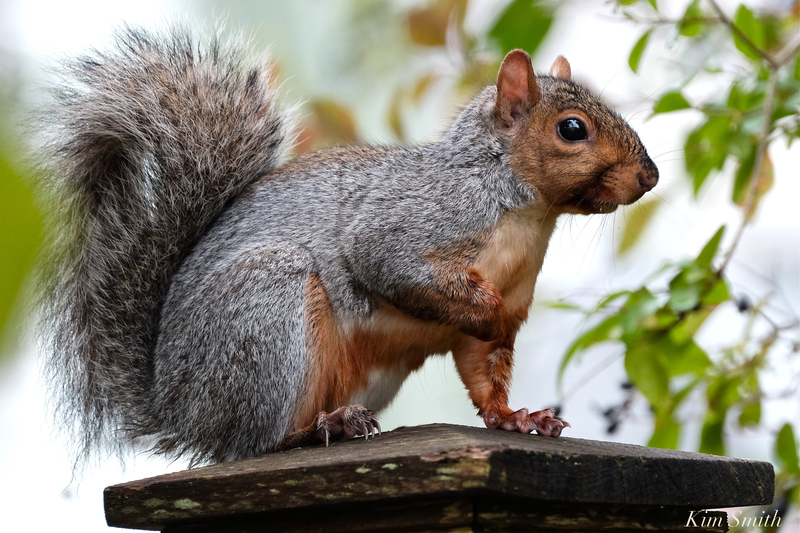 Gray Squirrels are mostly gray with white bellies. 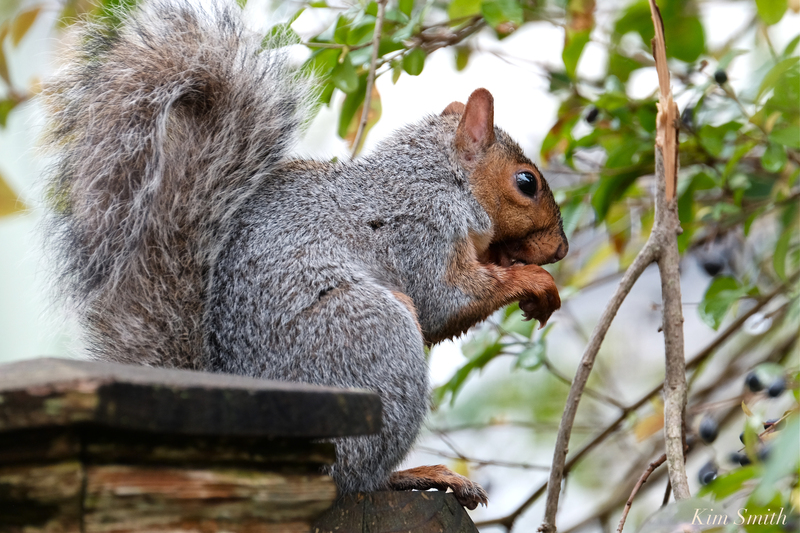 The average size of a Gray Squirrel is 9.1 – 12 inches; the average size of a Fox Squirrel is 10 to 15 inches. 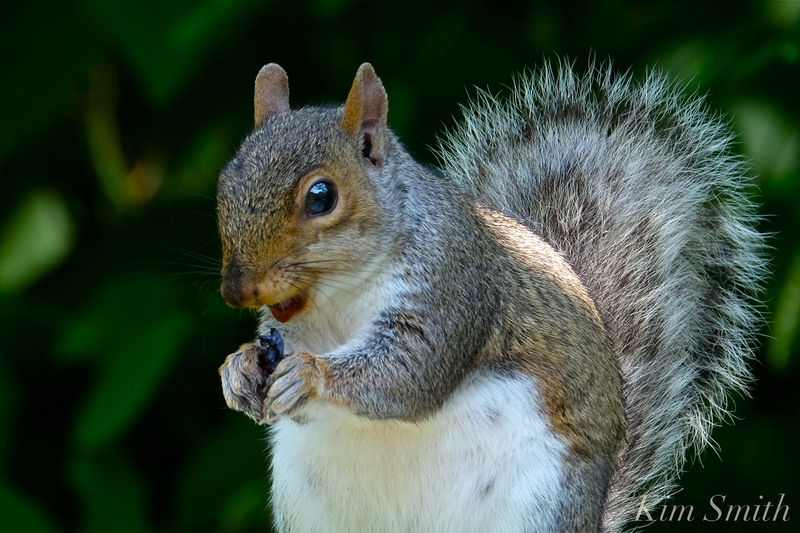 This entry was posted in Cape Ann Wildlife and tagged American Red Squirrel, Eastern Gray Squirrel, Fox Squirrel, Sciurus carolinensis, Sciurus niger, squirrlenado, Tamiasciurus hudsonicus, Tree squirrels on November 6, 2018 by Kim Smith.